Welcome to Home & Living Category at enfield-bd.com Whether you have moved recently and furnishing your new home or looking to refresh your current living space, so you can visit our Shop or get inspirations from viewing items in popular style trends. Discover our wide selection by room–living room, dining room, bedroom, children’s room, bathroom, kitchen, utility room, office and garden. Finally We’ve made it easy for you to browse and find the things you need to organised or decorate your living space. So now Make your home a favorite place to enjoy time for you, your family and friends. We need a lot of modern home appliances for a comfortable living; and Enfield offers the most exclusive collection of home appliances in Bangladesh. If you visit our Site, you will be amazed to see the versatile collection of these products. On our Home Appliance section, we have electronic appliances such as TV, refrigerator, air conditioner, washing machine, fan, telephone set etc. We have best quality LED, LCD & Curved televisions on our Site. We also have small portable televisions. There are single-door, double-door, triple-door fridges with different capacities on our Site. Bathroom accessories include soap dispenser, toothpaste dispenser, water heater, toothbrush holder, bathroom fittings i.e., waterproof tissue paper holder, shower head, mixer tap, wash basin etc. Sometimes it’s really irritating for you to find a mechanic & spend money even for a very minor repairing. For such small repairing, we have tools like pliers, glue guns, multi-purpose knife, screw-driver set etc. Enfield-bd.com are here to make your life full of comfort & indulgence ! 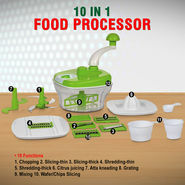 The 10 in 1 Food Processor is an ideal kitchen helper. It chops, slices, mixes, shreds, grates and has 2 speed gear knobs for maximum efficiency. It’s small design takes up minimum counter space & is cost efficient as it requires no electricity. BRIGHT ENOUGH: With 10150 lumen of daylight white, it is bright enough to meet your lighting needs. BEAM ANGLE: No shadow and glare with 120 flood beam angle. FLEXIBLE INSTALLATION: With 150 adjustable lamp body and metal bracket, it can be mounted at ceiling, wall, ground, etc. WATERPROOF: IP65 rating, which means it can be widely used indoor and outdoor both, like warehouse, garage, garden, yard, billboard, display window, etc. 10W Outdoor LED Flood Lights, Super Bright, 100W Halogen Bulb Equivalent, Waterproof, 760lm, Daylight White, 6000K, for Security, Garden, Yard. 8-Outlet & 4-USB: Perfect power strip for you to charge your Phone, PC, Tablet or other electric products at the same time. Product size: 5.7*5.7*8.5 inch. 9.8 Feet cord, gives you more convenience to move the socket. It can be used in your home, office or school. Convenient to use. Each layer has independent switch to control the power. And there is a master switch at the bottom to control the socket. Vertical shape design, takes up less space but provide more plugs for users. The mat at the bottom is to protect the socket from scratching and keep the socket more stable. Surge protection overload protection. It will automatically cut off power supply when the current overload. And it can be used normally after eliminating the overload problem.